Some days you simply do not have time for your usual workout. Perhaps you are traveling or you have meetings from dawn ‘til dusk. Or maybe something totally unexpected comes up and your workout time disappears. When life steals your exercise time, however, you do not have to forgo your workout. If you have just a few minutes, you can burn off 100 calories, get your heart pumping fast and redeem at least a little of your workout. Use them on busy days or even to supercharge your normal workout days. Most estimates are for a person weighing approximately 130-150 pounds. If you weigh more, you can probably shorten the duration, but if you are lighter, add a few minutes to ensure that you burn at least 100 calories. 1. Take the stairs. 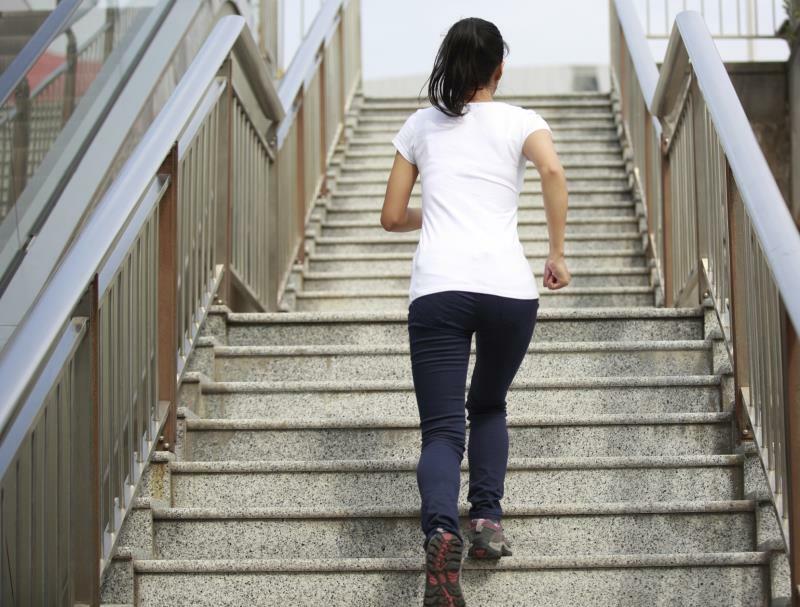 Stair climbing for 15 minutes will burn 137 calories. Have a 15 minute break at work? Find a stair case and set your phone alarm to alert you when 15 minutes have passed. 2. Run a 5-minute mile. By the time you are 4 and ½ minutes in, you will have already burned 100 calories. If you can’t get outside, just run in place. 3. Ride a stationary bike at 20 mph for 4 minutes 54 seconds. 4. Work on the lawn. Pull weeds for 17 minutes, rake leaves for 20 minutes, or dig dirt for 16 minutes. 5. Calisthenics. Spending 15 minutes doing some light bodyweight squats, lunges, jumping jacks, get-ups and knee-ins will burn about 137 calories. 6. Go for a walk. A 150-pound person will burn approximately 117 calories by walking at a 4 mph speed for 20 minutes. Walk in place if you do not have a good area to walk in outdoors. Try walking in place while you watch your favorite television show! 7. Grab the vacuum. Vacuuming your home or office for 28 minutes will burn 100 calories. This is a great way to sneak in some exercise at work and get on the good list of your coworkers! 8. Chop firewood. It is hot now, but winter is coming! Spend 5 minutes chopping firewood and you will burn 100 calories. 9. Swim laps. It only takes 12 minutes to burn off 100 calories while swimming. 10. Mow the lawn with a push mower. 14 minutes is all it takes to zap 100 calories. Newer PostWhat's Scarier than Ghosts & Goblins?